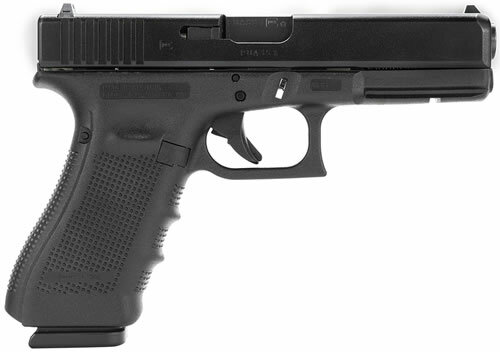 When bidding on this auction you are purchasing this NIB "Glock 37 gen 4 in .45 G.A.P.. The Glock 37 Gen4, in .45 G.A.P., introduces revolutionary design changes to this quantum leap forward in big-bore technology, Glock's answer to muzzle flip and high velocity recoil. The modular backstrap design lets the user adapt the grip to hand size, and the frame surface exhibits the scientifically-designed Gen4 rough textured technology. This model features a dual-recoil spring assembly that substantially increases the life of the system, and the enlarged reversible magazine catch easily accommodates left- or right-handed operators. The Generation 4 frame retains the Glock accessory rail for accessory attachment. Type : Pistol Action : Double Action Caliber : 45 Glock Automatic Pistol (GAP) Barrel Length : 4.49" Capacity : 10 + 1 Safety : No Manual Grips : Black Synthetic Sights : Fixed Weight : 25.95 oz (empty) Finish : Black If you have any questions about this item call (407)-857-5663, we strongly suggest calling in if you are interested in the item at all, we will try to modify our requests to meet your requests as much as we possibly can. When calling let the employees know you are a Gunbroker customer and the name of the auction you are interested in. Please remember that we are an operating store and you might be put on hold before talking to an employee. *Seller reserves the right to sell in store and or cancel auctions. * A 2.25% up charge will be added if using a VISA, MASTER CARD, AND DISCOVER CARD, and if using an AMEX there will be a 3.25% up charge. 3 DAY SATISFACTION GUARANTEED IF GUN IS UNFIRED OR YOUR MONEY BACK. If you see errors in this information please email us at [email protected]. Please specify "Data Issue with UPC on Item #802581562" in the subject line.